The latest Batman adventure will see the Caped Crusader take on al-Qaeda leader Osama Bin Laden. Comic book artist Frank Miller is midway through writing Holy Terror, Batman, which sees Batman defending Gotham City from a terrorist attack. "It is, not to put too fine a point on it, a piece of propaganda," said Miller at a US comic book convention. The veteran writer called it "a reminder to people who seem to have forgotten who we're up against". He said the story was "an explosion from my gut reaction of what is happening now". Batman has typically faced off fictional villains including Catwoman, the Penguin and the Riddler, but this is the first time he will have confronted a real-life threat. However, Miller - who revived Batman's popularity some 20 years ago with The Dark Knight Returns - said using comic book heroes for propaganda was an honourable tradition. "Superman punched out Hitler. So did Captain America. That's one of the things they're there for," Miller said. 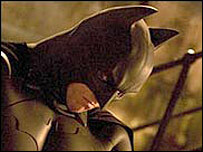 Batman returned to the big screen last year in the prequel Batman Begins, starring Christian Bale and Katie Holmes.